Freedom for Christian Women Coalition: Does the Christian Newswire Support the Subjugation of Women? Does the Christian Newswire Support the Subjugation of Women? The Freedom for Christian Women Coalition(FreeCWC) and Jocelyn Andersen have used the Christian Newswire in times past to distribute press releases. The news service featured an announcement of the Seneca Falls 2 Evangelical Women's Rights Convention on July 2, 2010, noting the formation of the FreeCWC. Perhaps that is why the Coalition was so shocked to learn this morning that the Christian news distribution service, a subsidiary of the Christian Communication Network, has decided to censure their press release concerning the petition to the Council on Biblical Manhood and Womanhood(CBMW). The FreeCWC decided to wait to submit a press release to celebrate the collection of 200 signatures, and was thus was made by co-founder Andersen on Saturday, April 5, 2014 at 10:55 AM. Christian Newswire sent the notice of decline by email on the evening of April 6th. Andersen spoke with an individual named Gary McCullough at the agency on the morning of April 7th. She was told that a committee reviews submissions, and it was their decision to “not distribute” the news release. McCullough would not disclose the reason for the censure. Read the email that Andersen received as well as the original press release below. We encourage the public to contact Mr. McCullough to let him know how disappointed we are that the Christian Newswire will only support press releases in favor of the subjugation of women. And naturally, the reader is invited to sign the petition if they have not already done so. Also of interest is the appearance of the Biblical Womanhood Statement arising from Southwestern Baptist Theological Seminary(SWBTS). One wonders how this substantially differs from the True Woman Manifesto and their program which this writer findsmanipulative. The Associated Baptist Press published an article suggesting that this new initiative at SWBTS was a response to the FreeCWC petition. Read more about the president of the seminary, his wife, and their participation with CBMW at a recent article at The Wartburg Watch. Apparently, they are also preparing to make a submission to the Christian Newswire. May theirs be approved. Subject:We have chosen not to distribute your news release "Freedom for Christian Women Coalition petitions CBMW to repent of war against women"
Christian Communication Network just sent you a full refund of $140.00 USD for your purchase. If you have any questions about this refund, please contact Christian Communication Network. This refund will appear on your credit card statement as credit from PAYPAL *CHRISTIANCO. If you have any questions, please contact Christian Communication Network. In 2010, the newly formed Freedom for Christian Women Coalition (FreeCWC) sent by FedEx a demand that the Council for Biblical Manhood and Womanhood (CBMW) apologize for their destructive teachings against women as outlined in the Danvers Statement, a harmful document released in 1987 which has united churches across denominational lines and has been adopted and implemented within denominations and local churches worldwide. To date, almost four years later, CBMW’s response has been dead silence. 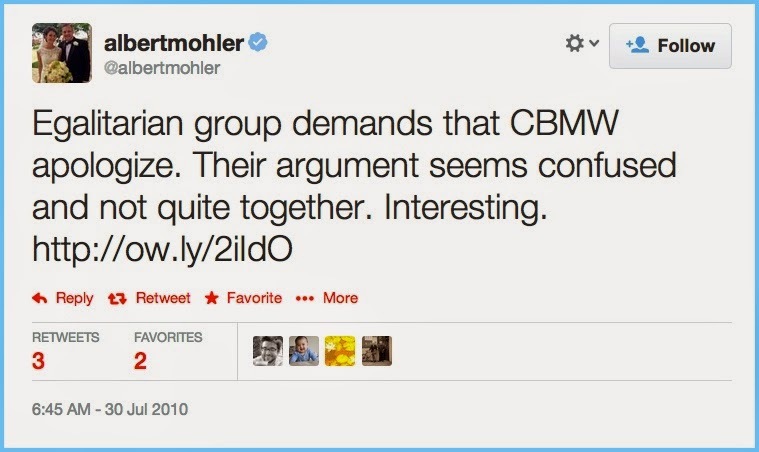 However, in 2010, Al Mohler, a council member of CBMW and President of the Southern Baptist Theological Seminary which is headquarters to CBMW—an influential seminary that aggressively supports the oppression of women through the precepts of the Danvers Statement—did attempt to censure FreeCWC through a tweet suggesting that supporters of the Apology Demand seemed to be confused and poorly organized. After four years with no response from CBMW, the FreeCWC has now taken their demand toChange.org in the form of a petition to Owen Strachan, Executive Director of CBMW. With 200+ signatures, and rising, Christian men and women are uniting in demanding change within the evangelical community regarding the derogatory attitudes and teachings against women propagated through CBMW, an organization committed to the complete subjugation of women both on earth and—according to Dr. Bruce Ware, a council member of CBMW, Professor of Christian Theology, and Father-In-Law to Executive Director Owen Strachan—throughout eternity. Co-founder of FreeCWC, Shirley Taylor, and Special Consultant to FreeCWC, Cindy Kunsman, are both available for comment.